Naruto is making me cry with each chapter it releases. The rebloggables are suddenly through the charts on my tumblr dashboard. Open Facebook or Twitter on a Jump release date, and there are people there to commiserate with. It’s the ending we always dreamed of, quietly gripping our rubber prop kunai, gleefully purchased as preteens at our first anime conventions. General spoilers for the manga; but very little in the way of specifics. The Naruto fanbase has always been a funny one, at once responsible for the latest and greatest push for anime and manga in the west, yet cringing at that which it has unleashed. It’s hard not to raise an eyebrow at the young girl, wearing the Konoha headband Sakura-style in her hair at the mall, awkward gaggle of mal-adjusted nerd friends and punks surrounding her. It’s hard not to sigh when someone cites Deidara as the greatest character ever to grace the screens of anime. It’s hard not to shake your head when someone tells you that surely Naruto is the best anime ever made. Even harder still, grappling with that oft-said phrase from a non-fan when you tell them about how your’e 25 and spend large chunks of time watching cartoons for Japanese schoolkids: “Oh… you mean like that Naruto stuff?” It’s hard to be a Naruto fan and still save a bit of face out there in the world, because the series is now so big that it becomes the target of all anime fandom’s ire, the quintessence of everything that’s wrong with the western fan community, with liking anime in general, and with admitting your adoration of the series in public. Which is why most people, when questioned openly about it for years have said they aren’t. But Naruto’s swansong is hard to deny in my heart of hearts. Kishimoto is hitting all the right notes. An all-out war against a common foe! All your favorite ninjas and more! Reuniting with friends old and new via the convenient plot device that is the Edo Tensei jutsu – tearful reunions (or, for some, introductions) abound! At the risk of sounding like an informercial, there’s really something for everyone to love in this latest arc of the manga. Not to forget the emotional, divisive return of the prodigal son. 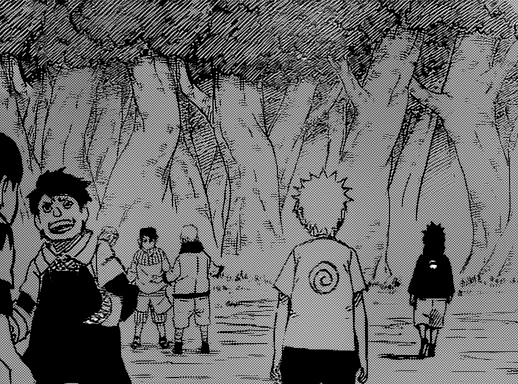 But more so than plot events, Naruto’s storytelling in this arc returns to what I fell in love with the manga for. A certain cheekiness missing from the more recent arcs has found its way into the Shinobi War, a sense of slapstick missing while Kishimoto painted the sad history of the villages and the tailed beasts. I missed those goofy faces. It’s an unfortunate situation that many long-running shounen manga fall prey to: either you keep a lighthearted tone, often sacrificing character depth (i.e, Gintama) or you continually up the emotional and physical stakes for your characters, which makes it difficult to incorporate humour without breaking the tone of the story (i.e, Bleach). For the first time in a while, I find myself laughing at Naruto, and that feels good. If Naruto is anything, it’s a spiral, just like Naruto’s family name. It doesn’t take a genius to realize that Naruto’s arcs all circle back onto the same things; indeed, are at times near mirrors of each other. From Naruto and Sasuke, whose rivalry was an echo of Jiraya and Orochimaru’s, continuing back to a time before the villages with Madara and Harashima, the message is clear: rivalry only begets more rivalry, death only more death. Time and time again, characters and rivals and opposing sides of a war try to overcome their circumstances, their biases, and their judgement to reach uneasy peace, failing time and time again. And so happy boys become loners become vengeful outcasts. And, looking at the story in that light, isn’t it better that no one lives (or dies) at all, that no one have the power to fight if all it causes is death? As if you had to be told, but Naruto – both the manga and its namesake character – would never be so nihilistic. “I should have called out to him”, Naruto thinks to himself, as if he hadn’t called out to Sasuke a hundred times since, chasing him halfway around the world, again and again, as if he didn’t continue to believe in Sasuke when everyone else had given up on him. We began Naruto with a tale about friendship and acceptance, and that’s we’ll end it, because in Naruto no one who walks away isn’t welcome back, and not even the demon fox is beyond forgiving. One thing I’ll always admire about Masashi Kishimoto is that he’s handled Naruto’s transition to leader with such responsibility and care, in fact, all of Naruto’s school-mates have matured in ways that are logical and heartening. Old friends is an apt way to describe them, really. I hope it all turns out for the best. If there’s one series that’s symbolic of my entry into this fandom, it’s Naruto. Of course, it’s also nice to hear about the essence of Naruto without delving into technical details of who beats who. 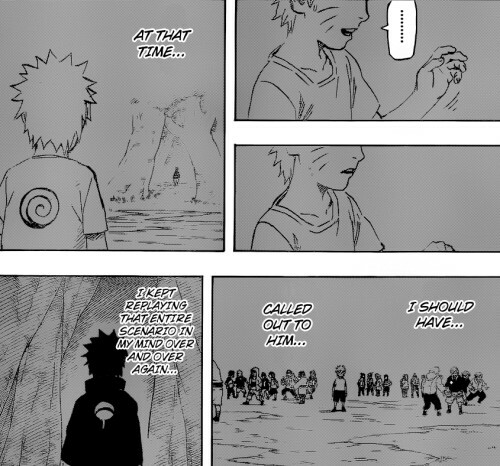 It’s the reason I am looking forward to Naruto’s culmination – the essence that you talked about, that is. About 50% of every chapter flies way over the top of my head – the other 50% is heart warming and makes me want to try my best in life, too.